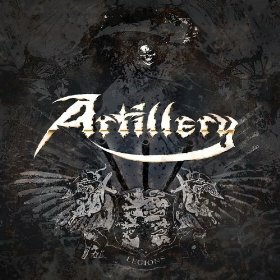 Share the post "Album review: ARTILLERY – Legions"
Metal Blade – Out Now. Formed back in 1982 in a suburb of Denmark’s capital, Copenhagen, Thrash Metal quintet Artillery possessed all the skill and passion necessary to make a name for themselves in the music industry but bad timing and lack of interest on the part of major record labels soon relegated them to the status of “cult band”. A handful of studio albums and various line up changes later, the noisy Scandinavians have decided to team up with Metal Blade records and give it another go, with “Legions”, the band’s seventh studio album, being the first product of this fresh musical alliance. The band made a fitting decision in employing the services of one Michael Bastholm Dahl behind the mic, as it is his immense passion and impressive vocal range that makes “Legions” such a powerful musical offering. Don’t get me wrong, Artillery’s strength always lay in the riffs, studiously prepared by the Stützer brothers, but Dahl’s emotionally charged vocal performances take centre stage in this album. If you add to that the youthful enthusiasm of the equally newly-employed Josua Madsen behind the drums, what you end up with is one of the most powerful Thrash Metal albums recorded this year. “Chill My Bones (Burn My Flesh)” is an energy-infused, Testament-influenced belter that introduces Artillery’s latest musical offspring in a truly glorious fashion and is followed by the equally urgent but melody-driven “God Feather”. The same-titled composition “Legions” finds the band slowing down a bit only to reach fever pitch tempos again in “Wardrum Heartbeat” – the album’s unquestionable highlight. In “Global Flatline” the band presents the grooviest aspects of its personality, while both “Dies Irae” and “Anno Requiem” provide plentiful melodic themes for fans to sing along to. “Enslaved To The Nether” is the closest that the band came to creating an 80s heavy ballad, while fans of Testament and Iced Earth will almost certainly appreciate the closing duet “Doctor Evil” / “Ethos Of Wrath”. The fact that a band with the skill and passion of Artillery have never managed to make a proper career out of making music all these years is an injustice in itself – something that probably will never be fully rectified as we all know too well that there is no major money to be made in the music industry anymore. What “Legions” will hopefully do, however, is attract the attention and introduce the band to a wider young Thrash Metal audience and convince, along the way, all you old-school Thrashers to dust off your bullet belts and wear them proudly next time these Danes happen to visit your hometown for a show. Thrash rules!